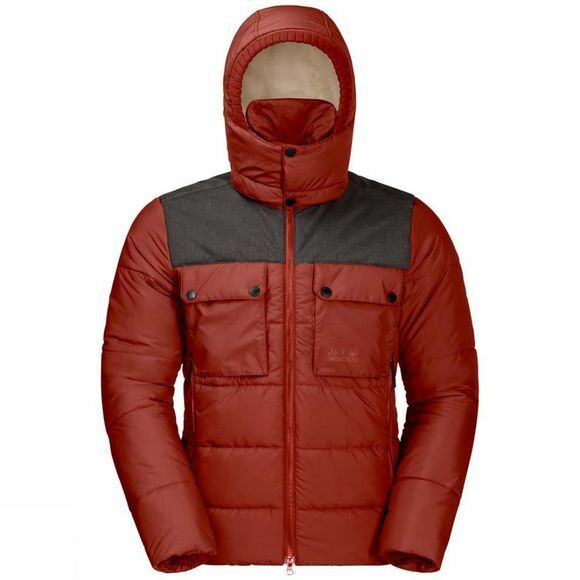 The Mens High Range Jacket from Jack Wolfskin is made with High quality Microguard Ecosphere and Windproof Stormlock which are more than a match for Winter snow storms.This cold-bustIng combInation of an Innovative Insulation material and a Windproof outer fabric is what makes the High Range so Incredibly warm. SInce the shoulders of the Jacket are the areas that are most exposed to the raIn and most affected by wear and tear caused by your backpack's shoulder straps, they are additionally reInforced with robust, waterproof Texapore. Light raIn, snow and sleet simply bead up and run off the surface of the fabric. And the synthetic Insulation MaintaIns its performance even when damp. With a total of five pockets, there's plenty of room for your phone, chewIng gum and other little items.